A story is going around the internet that, in some ways, sounds more like legend than fact. But the idea behind it seems to represent a cultural value that is real. As related on an Ubuntu website, an anthropologist made an important discovery after completing his study of a tribe in a southern region of Africa. While waiting for transportation to the airport for his return flight home, he decided to pass the time by proposing a game to some of the neighborhood children. He placed a basket of candy and fruit near a tree and, after getting the children behind a starting line, told them that the winner of a race to the tree could have all the contents of the basket. But when he gave the signal to run, no one made a dash for the finish line. Instead the children joined hands and ran together to the tree and basket. When asked why they chose to run as a group, a little girl spoke up and said: “UBUNTU, how could one of us be happy when all of the others are sad?” UBUNTU in the Xhosa culture can be expressed as, “I am because we are.” After many months of research the anthropologist realized he had finally discovered the heart of what he had been studying. The story has me wondering at what point the Apostle Paul discovered that the complicated culture of laws that he had studied so carefully could be, in Christ, summed up (though not fully illustrated) in the experience of one thought (Gal 5:14). I can only surrender my soul to God, not to my fellow man. I can only love my fellow man (neighbor), by loving God. I can’t just love my neighbor because it’s the right thing to do. I can only do so because it is God’s will for me to do so. I am an extremely introverted person and this idea of don’t be an individual, be a community, is a nightmare to me. This makes me think that loving my neighbor means different things to different people. I want to love my neighbor by letting go of perceived insults, providing a listening hear to a suffering soul, being kind, not hating, not taking what I could allow someone else to have… etc. It does not mean, to me, always being in a group or working for the good of the group. The older I get the more I realize that I am always learning. Such a truth is that for how could anyone survive as an individual for we all depend on each other yet in today’s world there is a driving force that is leading people to be ambitious and out for themselves. The Africans seem to have found Christianity in this practice of Ubuntu the proof that God works in mysterious ways. What you said Maru about dehumanizing is what members of my community were told was happening in our society. The terrorist’s had decided that we or at least our ancesters had discriminated against them and made us legitimate targets and then in effect what happened was that our side did the same back and it is a no one situation. The difficulty for multi cultural societies is who decides the common good. In the end we go back to our roots where we can again feel we belong. There seems to be a desire in us all to belong but in a world that is growing more alien it is becoming more difficult to find. Thank you Mart… your topic boldly awakens us out of our self stupor, and when explored either Biblically, or through the everyday living of life, even without the reading of scripture, each one finds he has a neighbor, another living thing exists for a reason, and that reason makes him become, just one more of many. It moves us outside ourselves, as it brings other possibilities of life, and brings them into a greater perspective. If we use scripture to define this premise, but it does not fit our current belief system, or it divides us for its profound truth, then, is it the person who cites a verse or the message it brings, that actually divides us? I bring to the discussion two biblical messages, 1 John 3:6, and, Romans 14:7. Those villagers don’t have their bibles to quote, with their ever challenging verses, or their interpretations of those verses, or their doctrines to define them, they seem to only have, a God-given life, and a God-given neighbor, and that seems to be enough for them to come together as a community. How much the learned among us, can still learn. Maru – I know when I said I am an introverted person, I should have phrased it I am a selfish person, because that is closer to the truth. I wish that following a practice could really lead people to treasure each other, but I am a skeptic and I don’t see that following a practice will truly change the human heart. I don’t understand about bringing “my humanity into it’s own” because I see my humanity as a tent that is fading away. Yes, I would say that God never wants us to “dehumanize” another individual. Not because they are human, but because they are made in the image of God. If only people would follow this practice, how good the world would be. But will people truly follow this practice – without the leading of the Holy Spirit? I’m not educated. I’m not an expert. My opinion is just that, an opinion. Nevertheless, I share it, and please show me how I am wrong in my thinking, but when I think of Africa, I think of large groups of people who are held in poverty and suffering by a few individuals with evil hearts who don’t follow the concept of doing for the good of the community. It’s not that I don’t believe that most Africans follow the Ubuntu philosophy; I’m sure they do. It’s just that I don’t think this philosophy has the power to save them. I so agree with you Tracey, if they have this philosophy, why is there so much poverty and terrible wars? I would say, that Jesus did even stretch the law of love even further then loving our neighbour as ourselves. And that commandment is impossible to keep in ourselves. We are failing at doing that at all. So we must bow in humility to God, and say, God you work this out in me, through faith in Jesus. And there the story of the thief that comes in, are we willing to suffer for the sake of the Gospel? But this story of the children is a true nice example of how God wants us to live together, I love the story all the same! I pray that not only the children, but all of them will be like this, sharing and caring for one another, and above all, I pray that they will find Jesus to help do them this even in adversity… when war strikes and drought.. I never knew that that was what they called it Ubuntu but while watching the children at the feeding program our church was sponsoring where they provided one hot meal a day to the children of the village. I was amazed as I watched all of them wait until every person had their bowl of food before any of them began to eat. What different are they to us then, being a Chritian does not mean that evil men in power do not have power over us. Jesus suffered at the hands of evil men and the world has not changed that much. Look at the great characters in the Bible most of them suffered for the common good. Why do we have wars but for the common good of men, for tyrants or religions have tried to control people since time began. God did not save Jesus from this world and if we are His followers He does not save us from it either. God never forsakes us but when we are suffering it will often feel like He does. As for the Africans who practise Ubuntu, it seems they already have a heart for God. It is God who saves so the Africans don’t need to have the power to save, we don’t have the power to save either, we follow like sheep. The practice of Ubuntu God had initiated way before the developed practice in Africa as He taught us what love is. There is no rush to the front of the line when we wait for others when we want everyone to share a like. How we care for ourselves we are to care for others. There would be no accumulation of things when we know others may need them and all we do have is stashed in a closet. seems to me that love would rejoice in an-others success or gifts God gave them instead of being sad or worse jealous like cain of his brother able. yes evil is real and love is the antidote. the problem is people think they can go to just any ole place for this love. God is love and there is no other. all love comes from God. i guess we are ambushed by so many counterfeits we become skeptics when the real thing shows up. we dream of a place of no corruption or evil. we dream of perfect love and being in this love. give me the hot stove….i have learned more about God and His Love then any other way. i do like the ice cream too! There are surely places all over the world where people reject Jesus, and have not received the Holy Spirit, but ubuntu appears to me to be based on mutual trust and respect. It seems to me our Creator God provides for His children who have not had, through no fault of their own, benefit of Bible teaching. In our time of history it would be difficult to find many who have not heard of Jesus — unless they were deliberately kept from hearing about Him. Just my opinion. Reading the wikipedia entry and the ubuntu website, I confess I flinch a bit at the “Age of Aquarius” reference. But, if Jesus-followers meet up with new-agers I’m not convinced we should grab a big stick. Perhaps our very fellowship would be a convincing influence even to those who believe they have found another door to Truth…condemnation might not be the key to persuading others. Just a thought. Hot stove or ice cream…. It think it is God’s grace that does not destroy us even when we have to go into a firey furnace. Blessed by fire or ice cream. Rewards immediate or everlasting. Along with street I too choose the fire. I have seen too many fake Christians who think that ice cream is proof of blessings from God. I was almost convinced of this myself at one time. Boy did God prove that theory wrong! remarutho said,”Truth…condemnation might not be the key to persuading others. Just a thought. what captured your heart and set you free? was it not the truth and love of God? oh, to be like Him completely. didn’t i read somewhere we are like Him. what keeps us in the dark? the world is a zero sum adventure. it is temporal. God said if you can not be trusted with “worth-less” treasure who will entrust you with real treasure. faithful in little will be faithful in much. practice without substance, as paul and james would agree, is a lie and emptiness. children teach us much because they are so humble. i have not run into an anthropologist yet that spoke correctly all the time. i think the stones and bones do tell a story. it’s just the adding to the story gets us on a hot stove. eve can testify to this. Thanks for the response to what Tracey originally wrote. As you have done, I immediately thought of the NT letters. Specifically, my imagination remembered what Paul said in Romans 2:14, 15,16.
dear tracey5tgbtg read your comment and can relate greatly. i was at a neighborhood meeting a while back and it hit me i don’t love these people and i do not want to know most of them. hard truth to swallow, but true. i also know it is evil/selfish to think like this since Jesus loved them enough to die for them. He even made them, shortcomings and all. i keep thinking you can not give something away unless you receive it, just give me Jesus. i wonder if you give Jesus away that you would run out or lose Him? thinking like a child, hope that thinking stays around. God bless you in your faith. Appreciate the way this conversation is trending, because there is something behind the “I am because we are” world view embodied in ubuntu. If a community practices ubuntu, it must also be in God’s presence. If not, as some have said here, there can be no truth or justice because God is the Source of these life principles. There are consequences to every choice — and there is much woe when we oppose the moral universe. God is everywhere and He does not suffer fools. About 14 years ago I bought a trilogy of VCR movies titled “the Apocalypse trilogy” by “Cloud ten Pictures. I also have a couple of the “Left Behind” VCR movies as well. Both story lines use the future concept that if the world can just get rid of the “haters” (Christians) all the world would be just one big happy family working together for the enlightenment and benefit of mankind. Of course when the “rapture” occurs the world begins its unifying merge of becoming “One World”. I read Mart’s new subject this morning as soon as he put it up and right away I had a red flag pop up in my spirit. So I went to and looked at the two sites he included to see what was up. I backed out of the sites and walked away from the computer. I did not want to say anything concerning this subject right away because it was going to be negative and I did not want to influence the conversation from the beginning. Rather I wanted to see if anyone else picked up the same message from the Holy Spirit I did. When I first read of the children’s story I did not believe it to be true. I still do not. Too many internet stories turn out to be fiction. When I went to the site and seen that Ubuntu is a philosophy and who ascribed to it I was finished with the matter. There is no utopia on earth because of sin and there will be no perfect society until Jesus of Nazareth the Messiah is on His throne in Jerusalem following the “tribulation” and no perfect earth until the new one is made and hell, death and sin are forever cast away. Sorry Mart I am not biting the apple. Not that I am against ubuntu in principle, but a look at the ubuntu website had me immediately thinking an email I received on the New World Order. That website and that email seemed to fit together. One religion for all, a one world government, things falling into place for the anti-christ to rise. And because EVERYONE seems to be saying that we are, indeed, living in the end days, I become skeptical and quite honestly, fearful that this ubuntu website is all part of it. I too, Maru, cringed when I read Age of Aquarius. That sneaky word “inclusion” also had me put some red flags up. Anybody who isn’t aware of the New World Order, can google it. Pretty frightening stuff. If it all just ends up being scare-mongering, conspiracy theories, I say oh well, I got sucked in by it but you know what…if it is true……. There are several Bible verses that tell us what will happen in the end days and give warnings to be watchful, alert and be on guard for many will come to deceive and many will be deceived. Costs me nothing to be wary but it will cost me everything if I’m not. I DID NOT read what you posted before I posted my comment. Seems we agree. My spirit has been troubled since viewing the ubuntu website. Agree that condemnation serves no purpose. Also am in agreement with Paul’s words in Romans 2:14-16. Yes, I believe that a heart that is striving to cherish his neighbor has the laws of God written on his heart. In fact, I had a bit of a falling out with a Bible Study leader on whether those who have not prayed “the sinner’s prayer” by their point of death are doomed to hell. I can’t help but think of people who have been raised from the moment of their birth with the mindset of their family, community, and country. I have a Judeo-Christian background in an English speaking Midwestern part of the US. I want to be good, I want to fit in. What if I had been born to Muslim parents in the Middle East? I would still want to be good and I would want to fit in. That would lead me down a different path than the one I’m on. So my thinking is that God can make a way, even for those who can’t grasp Jesus Christ because of the culture they have known from birth. I don’t know how God will work it out, but I fully trust Him. Some disagree with that. An argument for another day. Agree so much with your last comment Maru. I also thank phpatato for her comment about the courtroom. A hearty amen to the fact that we discuss, but in the end we lay it all before the One who judges all things. This subject is by no means cut and dried for me. There are many aspects to think about. It’s just that even with the law simplified so much, I still fail. There is no law, no good work, no utopian idea that I can succeed at. Always, I must trust my God, who called Himself I Am Who I Am. Seeing the concept of Ubuntu lived out is beautiful because it shows what community is all about and what Paul describes in much of the early church and what one thinks about when expressing the love of God in the community of believers. Another good example of the opposite is breaking a pinata and all the kids rush in to grab as much as they can, then the meeker children scavenge around to find the few small pieces leftover but the one that was first in there never looks back to see if everyone has something. Or an Easter egg hunt where the more out going children go around finding lots of eggs while the shy kids get hardly any and then the one who gets the most gets another prize on top of it. The lesson is to forget everyone else and get what you can as soon as you can. ubuntu and the story of an unexpected basket of blessing from a man made game is cute and quaint. sure it’s easy to share in a blessing. why didn’t he address the issue of sharing in suffering, pain and death. how would the children over come this? would they blame God? some times we need to look behind the curtain and take off the rose colored glasses and get sprinkled by blood. don’t mix the salt with other stuff. The story of the children and the basket probably is legend, as Mart hinted at. However, my opinion is that there is truth in this legend, and that situations like it have happened time after time. It reminds me of when our school was visited by the curator of an African museum. The curator had brought lots of artifacts to introduce our Down East Maine children to African culture. One of these was a musical instrument that he asked if the children wanted to try. One boy jumped up and said, “Can I be first?” The visitor looked at him, was silent for a moment, and then pointed to another child and said, “Tell me why he should not be first?” Of course there was no answer to that, and so he pointed to another child and asked again, “Why should he not be first?” This was so much more effective than my usual answer to the question “can I be first?” I usually respond, “Whoever asks to go first goes last.” But to stop and think about why someone else should not go first makes the child think about others. This is Memorial Day weekend and a very active and busy one for us. We set up an umbrella table and chairs at the flag pole circle in our cemetery and ask for donations toward the maintenance and care of our cemetery. We have a sign in book, maps and information available to all who need assistance or who just want to set and visit for a while. We place American flags on all of our veterans buried there in honor of them and their sacrifice. Families from all over the country that can, place flowers on their loved ones graves. Of course there are some that either do not contribute, as well as do not place flowers or decorations on their families’ graves. Either way the cemetery looks very nice and is all decorated by Monday the official Holiday. This is accomplished by some who work to accomplish it, even though there are more who do not. By asking and receiving donations those who donate feel as though they helped, so good feelings are shared and spread around. The key word here is *sacrifice*. The concept of loving your neighbor as you love yourself means many things and not always in the combined action of lemming’s as they commit mass suicide. If you love your neighbor as you love yourself you would do nothing to harm that person, but may desire that person to treat you in the same way; it’s when they don’t and you love them anyway that you show your Christianity. When you give up something for another that is a sacrifice. When you *expect* it in return it no longer is a sacrifice, but a debt instead. If you want to see “Ubuntu” in action in the animal world look to insects especially ants and termites, but even in these examples insects from a different colony or family are not welcome and often killed. What do you think the followers of “Ubuntu” want to kill off? I think it is the individual in favor of the corporate mentality. The problem being who heads up the corporation and is honored by its actions. 32 degrees under clear skies this morning. Isn’t being a Christian corporate mentality Steve? We share one goal, one purpose, one cause and unity in our beliefs. That is to bring glory to the God we worship. It does not take away our uniqueness as individuals but brings those individuals together as the body of Christ. Just as the members in our physical body work together like a toe, leg, arm each has it’s unique purpose and if one part is hurt or in trouble the whole body suffers. 1 Cor 12:14-20; “Yes, the body has many different parts, not just one part. 15 If the foot says, “I am not a part of the body because I am not a hand,” that does not make it any less a part of the body. 16 And if the ear says, “I am not part of the body because I am not an eye,” would that make it any less a part of the body? 17 If the whole body were an eye, how would you hear? Or if your whole body were an ear, how would you smell anything? 1 Cor 12:25-27; “This makes for harmony among the members, so that all the members care for each other. 26 If one part suffers, all the parts suffer with it, and if one part is honored, all the parts are glad. It does not surprise me that so many have misunderstood what the point of the topic is because that sadly has become the norm. That Ubuntu is real and people do act like that wanting not just one person to be have while others go without that makes them sad, when all the whole group could share. It seems their understanding of what God has wanted in loving others as you do yourself is not only words for them but actions. Appreciate your description of your appeal to the community there, Steve, to support and care for the cemetery. We will gather at our cemetery on Monday for a brief observance honoring the dead from the time of the Civil War to the present. We take turns saying something in front of the group. Memorial Day is a good litmus test for the strength of community ties and “community spirit.” The personal sense of being part of the community is vital to the quality of life. A well-known political figure once repeated the wise saying, “It takes a village to raise a child.” The saying is African in origin, I believe. It reflects ubuntu. Community is about expectations in the human circle, but also about the individual heart willing to sacrifice for others, it seems to me, as you mention. To come to Jesus is to confess, “I belong to you, Lord, and you belong to me.” No earthly basis I can think of is deep enough, wide enough or strong enough to support the needs of this creation we inhabit. 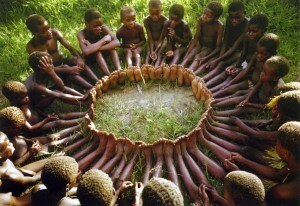 Ubuntu is beautiful once the chief cornerstone is laid in my opinion. A program called Shop with a Cop is in place here to provide needy children with Christmas presents. The local newspaper has included stories about this, and several times the officers are touched because instead of these children choosing presents for themselves, they will ask if they can purchase gifts for their families. My place of employment provides free fresh fruit for children twice a week. Sometimes someone will not want a piece of fruit or there is extra. I’m touched when children ask if they can take a piece home for their siblings. Talking about sharing my father says he got a red face when he took my son to his nephews. I do not remember the age he was but he was not very old and my cousin gave my son £1 and my father says he held out his other hand and said I have a wee brother at home and my cousin had to get another £1 out and my Dad was ever so embarrassed but I was very touched at his thoughtfulness. Enjoyed your comments this morning Steve. Thank you. Lewis, C. S. (2009-05-28). Mere Christianity (C.S. Lewis Signature Classics). HarperCollins. Kindle Edition. I don’t mean to share these as advice to others, but rather these are things I feel that I need to concentrate on in my own heart. I know CS Lewis is not everyone’s cup of tea, ;o), but he speaks a language that I can understand. Perhaps especially Mere Christianity and The Great Divorce. Though, who can resist The Lion, the Witch and the Wardrobe? Lewis teaches me that there is a moral universe, and that the very “oughtness” embedded in human DNA leads the human heart to faith in God and in His Christ. His work hold many keys to talking about religion as reconnecting with God. I thought it was Tracey that was speaking about C.S. Lewis. Saled fascinating story. We can learn so much from other cultures as Mart pointed out. I have my own story of something I learned from a Hispanic evangelical pastor here in Mn who was addressing a group of us in training to be Guardian ad Litem’s. We happened to be all white teachers, lawyers, etc in a part of the training about cultural sensitivity. As this pastor spoke about his church and the people he served who were mostly recent immigrants- migrant workers we learned a lot, but the response he gave when someone asked “why shouldn’t they learn our language and act like Americans” was priceless. I can’t remember the exact wording but his response implied that Americans think their culture is superior to all others and asked us to rethink that. We can learn from other cultures but sometimes our arrogance because we hear every day how we are THE world power makes it easy to feel somewhat ‘on top of the world’ (pun intended) when thinking of others. Learning from children sounds like something Jesus said, doesn’t it? And His culture was not American. Thanks for the correction, Pooh! Yes, I believe I spaced over the change in speaker after the great story about the 1Lb note! Apologies to all: especially Vivien & Tracey! My follow-up comment is properly addressed to Tracey. Tracey, thank you for the C.S. Lewis quotes about loving your neighbor. First the action, then the love, the substance behind the action, will follow. This is counter intuitive, but I think there is truth in it. We teach children to be polite, to let others go first. But is this the same as teaching them to consider others? How does empathy develop in a person? Does anyone else remember that time in the ’60s when many stopped saying “have a nice day” because it had become so rote that it was meaningless? For me, these questions make me want to live my life more mindfully, more aware of both my actions and others. I think the busyness of our modern lives may be the main enemy of the Holy Spirit. A little snow here in Maine yesterday, and I had to wear winter clothing while getting my garden ready to plant potatoes. But there is a big warm up promised for today and into the coming week. With the lilac and apple blossoms ready to bloom, it will be a lot like the return of Aslan in Lewis’ The Lion, The Witch, and The Wardrobe. I’m so looking forward to it. It would be so nice if it was just the busyness of life rather it seems than self obsession or self gratification but it does take time to pull back and think before we do anything. Considering and trying to understand what walking in another person’s shoes may be like. I only have seen South Africa but those children who practice Ubuntu most have lost both parents to the AIDS pandemic or war and are normally left to fend for themselves so they wait for others. The eldest in the families which may be up to 12 years old are the care takers so it makes the practice more meaningful when one considers that. I was out in the car the other day and I looked at the ques of cars and wondered how busy our road had become. At the same time we have to understand that as we become multi cultured societies then people are free to come to our country and when I was shopping I hear so many different languages that I realize we are now multi cultured. This challenges me to accept that I have to share with those of different beliefs and religions and while I long for the peace and quiet of yesterday, I cannot live in the past. Ireland voted yesterday and legalised gay marriages. The vote was a landslide as 62.1. percent voted Yes. Northern Ireland is now the only country in the United Kingdom that as not legalised it and the pressure is already on for us to go to the polls. I tend to think also that the busyness of this world is an enemy of the Holy Spirit. I have to see God at work in todays world but it is becoming more and more difficult. Ireland was always a Roman Catholic nation and the result is seen as a shift in religion to a state run country. God works in mysterious ways and He may use this to bring down religions in order to bring about the change we need in the world. Living in a country were religions all believed they were right caused anger and hatred that kept a country in hostility for 30 years. Whatever my fears for my country or this world I still see the hand of God and that for me is my biggest challenge in this world that as changed so drastically from I was a child and not only to see it but for me to take hold of it so that I do not feel lost in a never changing world. Being a child all alone is not as safe as the community together. Ecclesiastes 4:9-12 NLT; “Two people are better off than one, for they can help each other succeed. 10 If one person falls, the other can reach out and help. But someone who falls alone is in real trouble. 11 Likewise, two people lying close together can keep each other warm. But how can one be warm alone? 12 A person standing alone can be attacked and defeated, but two can stand back-to-back and conquer. Three are even better, for a triple-braided cord is not easily broken. Pseudo… Sham; false; spurious; pretended; counterfeit; closely or deceptively familiar; illusory. I pray none of you are deceived. Look closely and see who is lifted up, is it Jesus or a pretender. Satan, the liar, uses subtle little wedges to separate you from Christ, open your heart to the Holy Spirit and eyes to the truth. If it doesn’t come to you in the name of Jesus of Nazareth for His glory it comes to you from something else. I will not join in the feast of sweet and sugary idol worship, I am done with this subject. Steve, is it idol worship to think of others before yourself that is love? I do not see anywhere, in any of this topic that one worships Ubuntu it is a virtue that shows care for others. The definition is; a quality that includes the essential human virtues; compassion and humanity. Could it be that close minded prejudices have so tight a hold that it is not God’s spirit being listening to at all. If you will read about the beginnings of the church in Acts you will find the same principles centuries earlier are what Christians lived out not just talked about. It is similar to cooking a great meal but some of the neighbors could not attend maybe because they had a problem getting there or got sick. So after the cooking is done, meals are brought to those who could not be there before everyone else sits down. The opposite would be everyone eating then taking the leftovers to those who could not be there. Which shows more compassion and care for others? Which one is expressing the love of Christ and the only way to have that kind of love is from the indwelling of the Holy Spirit which was gifted to mankind at Pentecost by putting the needs of others before their selves. Pooh – respectfully – one really must look at their motive in putting others first. Let me try to explain how I see this, although, I know this is a subject that is truly up for debate. God commands us to love others, to think of others as better than ourselves, so we work on this, in our hearts, because God commands us to. When I see the Ubuntu website, I don’t see that what they are practicing is truly being done out of love for God. Rather, it seems to be to me, in my opinion, Socialism 1001. It is a way for a few to control many. So many docile people, conforming to the group, not thinking on their own, but following what they are taught; it is a group that is easily led. Who is doing the leading? Following the law does not make a person more acceptable in God’s sight. The law breaks our hearts and in our broken state we can come face to face with the love of God, and we are His to command. Putting others first, looks good on paper, as does socialism, but people are not perfect; they are flawed and it is easy to be led away by evil if your heart does not understand why we must humble ourselves. We love our neighbor as ourselves. We worship God, not our neighbor, and not ourselves. Does God want us to follow Him because someone told us to? Because that’s all we’ve known to do since the day we were born? Or does He want our hearts to be reborn? The first circumstance I have would have the sense that we are all eating at the same time and the meal would be so much more enjoyable to me. The second I would be sitting there thinking about my neighbors going without while I was eating and for me I would not have much peace. So thinking that the concept of ubuntu is foreign to God’s way seems like one may not be that familiar with God’s ways in the first place. The problem with reading the website is looking what the specific anthropologist was trying to learn in Xhosa tribe by seeing it acted out in the children. Not reading all the other uses of the word as applied to many other areas but just specifically to what was said in the topic. Anyone can take any meaning of any words and make it more complex that what it was intended. It is like throwing out the baby with the bath water. To me has nothing to do with a “have to” spirit but with I “want to”. It is not to “gain” love it is to “show” love. Read Acts chapters 2 and 4. Tracey yes, socialism has been the word that for me comes to mind when reading this post. It is very NICE and gives one a warm and gooey feeling, but as Steve pointed out also the idol of culture is just that, an idol. When living in the Kingdom we are part of the greater Kingdom. The point of understanding, I believe, other cultures is to befriend and evangelize. Not a popular thing to do when Peter was still learning nor for the world today. We need to be careful with our use of analogy because it is always just a shade of the truth, not the Truth. Or perhaps a road mark on the way to learning Truth. God bless us all with the Truth of God and His Kingdom. Lord Jesus Christ son of God have mercy on us sinners. That feeding program I shared earlier it was not a rule until everyone got heir food none are to eat. The children themselves did that all on their own. One day one child had forgotten his bowl and they still waited until he went and got it before they began to eat. They made that choice not the people who were administering the feeding program. It was not a rule. I was so stirred with emotion I could not get over it. As far as the people who were serving the children were concerned they could eat as soon as they got their food but the children took upon themselves to wait for everyone. That is not socialism that is compassion. If any of you has a chance to see, “The Good Lie” with Reese Witherspoon you may understand the concept better. I am frankly very confused how the actions of those children have anything to do with government nor did the first church have to do with government. I so understand what you are saying tracey about socialized government and agree. It is very oppressive and takes from the rich by force to give to the poor so the poor will be dependent on it but this is not about that it is about children sharing what they have from their own free will with their community so that none are sad and go without. At least that is how I am reading it, I may be wrong but to me it is the farthest things from socialized government. It is a beautiful thing to put others before yourself. It is not the natural inclination of the flesh to do so. A baby doesn’t wait to cry until his mother has had enough sleep. It is an action that must be taught. Who is teaching it? Why would a leader of people teach it? Why does a Christian teach it? I agree with Pooh these childrens behaviour was coming from a god given spirit whether they realized it or not! Would the world not be a better place if we adopted the same spirit thoughout. We are all from different cultures and nations yet this behaviour should be what non believers see in a believer rather than the greedy behaviours they do see. What are we being taught in the west that is taking us away from having a god given spirit! I live in a community of believers yet most of them would find a good reason not to give to charities on the basis that they don’t know where it is going! Is this the spirit that God wants us to have, a suspicious one or are we to trust! I have been told I am too trusting because I give to a lot of charities. and I pay it by direct debit direct to them. This to me is behaving in a way that would please God because it is support which they need or am I like some say being fooled into paying money into questionable causes! Who can I trust in this world today apart from God himself if people can stoop so low as to set up charities and use the profits for their own personal gain and just how are Governments regulating these charities if this is being allowed to happen! Sorry for going off topic but it makes me both mad and sad to think of such going on’s. the cares of life definitely are enemies of the Holy Spirit. being more mindful of our action and response to circumstance will make us more like one trying to keep the law. it just doesn’t work very well. what is need is to take up the cross. it easy to say but it’s true meaning is quite clear. when you do this daily you are saying my thoughts common sense ideas and way of doing things need to die. i need new thoughts the old were not working anything in me but death. we pray your kingdom come ring a bell? paul worked diligently till Christ is formed in the people/ disciples he taught. it’s ok, the work will get finished you can be sure of that. been thinking about prayers for strength and help in time of need. thinking these are the wrong request, in that deliverance is what we really need, not strength and help so we can struggle more. deliverance from evil comes to mind when Jesus was asked to teach them to pray. just thinking…..should be praying. Mart I can see how you thought of Galations 5:14 after observing the actions of these children. Purely metaphor. Just trying to keep it simple! Street, you may be right. Maybe being mindful could be about keeping the law. Or maybe it could be about taking time to put yourself in the other person’s shoes. Steve used the words sweet and sugary idol worship, and Tracey used the words socialism 1001 to describe Ubuntu. When either this concept of Ubuntu or the Golden Rule are followed just because it is the right thing to do, I guess it is in our own power and an attempt to keep the law. But I think that C.S. Lewis is on to something when he says to act like we love, and the love will follow. Maybe I am not far enough along in my spiritual journey to embrace taking up my cross. I love pooh’s stories of the African children waiting for each other. I don’t think this is sickly sweet, I think it is real. It’s true caring, it’s not trying to be proper or keep the law. And it wasn’t a basket of candy they were sharing; it was their sustenance. Ubuntu or the Golden Rule would be easier to keep if it were candy that we were all racing to get. But it’s not candy. “Your kingdom come, your will be done” and we can all stop racing for our sustenance. I wonder if we may be assuming these children do not know the Lord? The ones I shared about happened to know the Lord and their faith was none like I have yet experienced. They have to depend on God for everything, their daily bread, protection and guidance. The Word is going out all over Africa the difference there and in America or other western cultures they do not depend on themselves or self righteousness but from the Hand of God and they act on what they believe. The 200 girls that Boco Haram kidnapped where all Christians. Their captors made them dress in Muslim clothes. Christians have brought in Education. Most tribes have a church close by they read and learn from their Bibles. this brought to mind John 6:45 It is written in the prophets, ‘And they shall all be taught of God.’ Everyone who has heard and learned from the Father, comes to Me. 46 Not that anyone has seen the Father, except the One who is from God; He has seen the Father. we learn to love because we are taught to love. it’s a 180 from what came naturally. much like a kid mimicking his father, except the Father put a New Spirit in His children. May Memorial Day be a day of good memories of loved ones and those who have made the ultimate sacrifice for us — for each one here who observes this holiday! It seems to me, Mart as you said, ubuntu is a “cultural value that is real.” Not sure a cultural value is a theory or an idea — more a way of proceeding through life, right ways to behave vs. wrong. We soak up such a value much as we absorb nutrients from food and water, in my opinion. We don’t think about it much. My sense of ubuntu is that it causes those who live by it to joyfully take up the ways Jesus has taught as pleasing to God such as gentleness, mercy and peace-making (Matt 5:1-10). Ubuntu may not meet the test of “righteousness,” but it also does not oppose the presence of Christ in a person’s heart. Perhaps ubuntu can be compared and contrasted to other cultural values such as “welcome strangers” (Middle Eastern value) or “self-reliance” (a famous Western value) or “non-attachment” (Eastern value)…Just thinking. I believe that whether a person is aware or not of God’s presence in him is not what matters to God. A person’s behaviour will reflect that he has God’s presence. I on the other hand knew what it was to have Satan’s influence over me. This is why I remain at the cross because it is important to my journey that I know I have salvation. Satan is always messing with my head but God has instilled it in my heart that the voices telling me I have to do better are not real. It is still teachings that are not Christ focused that is leading people away from God today and I see it in my own environment. How do I have peace today living in an alien world, the answer for me anyway is Christ crucified, Christ risen, Christ will come again! He is the first and the last! The Church I was brought up in has never taught anything else, it was I who was led astray by false teaching and it is why today I hate to see so many still being taught that they have to earn forgiveness. I hate also to hear people who claim to know Christ saying I am forgiven so I can do as I please for it is either by false teaching or wayward thinking that they believe this. This world needs to get back to the teachings of Christ not the teachings of men! When the voices in my head tell me I am forgotten I think of the chorus of a song sung by an Irish group! Unlike our missionaries today those of days past in the USA alone came in and forced the natives to dress, act and behave like they did or they would not be accepted but called Satanic. They did not seem to look that God has given every culture a piece of Himself. There is so much of the native cultures that one can see the heart of God well unless one is walled in with prejudices. Now people go in and learn the similarities just as Paul did in Athens. We have much to learn not only in languages but cultures too. I bet that folks from other countries who are not used to materialism like they are here would say we worship Satan and I do not think they would be far off. Most often success is measure by what people have rather than who they are. What one family does if others do not do the same they are shamed or ostracized. Look at the how we treat people that are different physically like deformities most in the western culture alienate them while in India they are held in high regard like a god. If someone is born with a malformed face like we called the elephant man but in India he was made into a deity or a child born with multiple limbs. Not saying that is right just different. So those children who are showing love for each other are living out more than those who throw out accusations that it is from Satan. People are not drawn to a loving Savior by our words because most of the time it is only words and the hearts are so very, very far away from God. Christianity has dropped from 78% to 70% here in the USA and in Africa has grown from 9% to 63% and it is very obvious the reason why because it seems to be just a label that people like to wear here with no actual evidence in the behavior which gives most a sour taste in their mouths and the behaviors show no evidence of trust or dependence in/on God at all. While in places like Africa people live out their faith which seems to draw others in like it was when the church first started and grew and grew and grew. This is so true and my Country and myself are such an example of what not to do. When the English soldier said to me we had many Churches and Chapels but very few Christians he was echoing what I was seeing for myself. The English have suffered great loss from hatred by the Irish and it is a hatred that never seems to go away! The truth is I was not proud to say I was a Christian when my country men were behaving in a non-christian way. The one thing I found is that you are sterotyped when it comes to one Country hating another. That soldier was not interested in my beliefs for they did not make any difference to his situation, when men from my Country took up arms against them then I too ended up at war! I wish I could say that men’s hearts are on peace today since the cease fire but I am too aware of how men’s actions rarely align with their lip service especially when their words are used as a strategy to achieve their own goals and not driven by a god given spirit. How can one grow in their knowledge of our infinite God being so narrow minded they are crippled? Yes Joyce with God all things are possible. I discovered that when I was driven to examine my own heart and not that of my fellow countrymen. It is so easy to judge another when forming opinions. God is always at work in everyone, if He is doing a good work in me then He is also doing it in others. I can be so blinded by my own desires that I forget to look around me at the changes for the better and war has made me weary but God works in my children and they are energised and have a clearer vision than I. Thank God for my children they keep me young and focused on a better world to come! Viv I too thank God for your children and how He has blessed you. In the states we are celebrating Memorial Day, a day to give thanks to all the servicemen who have fought in wars all over the world. It lets us give pause to things around us and remember the battles long forgotten and currently engaged in. Does your country have a day of celebration? I believe both Steve and Gary are our war heros on this blog. Probably others I’m not aware of; would love to hear of others. Yes, Joyce, Here in the UK it is celebrated on the 11th November and we sell poppies which goes to the British Legion for the war veterans. We also have private memorials for members of the Police, Army and Prison Service members who lost their lives in the conflict here in Northern Ireland. There is conflict here on a proposed memorial for all victims of the troubles because terrorists names would be included on it. There is a playground here named in honour of a terrorist who was involved in the Kingsmill massacre. to save mankind-yourselves you scorned to save. If anyone has 13 minutes this morning discover the word dot org was very encouraging. Another wonderful teaching is found on the day of discovery dot org. I am often surprised not in a good way how many actually do not believe what God does within the heart of mankind. I would also take from that a lack of believing in the authenticity or reliability of the Bible but obviously one would have to believe in God first. It seems some hold to the thought that it is all a myth or superstition. I guess that may be why it’s truth that have been taught are so hard to understand because one has not experienced them in life yet to know it is all real. Chris thanks for the good reminder. Even now I tend to make things so complicated when simple, child-like faith is all that’s needed. Going back to simplicity. Have we become so consumed with our thinking that we lose the heart of Ubuntu. Ubuntu was shown in the heart of the believers when they sold the excess of what they had with the empowering of the Holy Spirit(Acts 2:44-45 NLT) so that others did have to go without or even in the times of the law where the Israelite’s were taught things like leave the outskirts of the fields unharvested so that those who did not have any means could glean from them. (Lev 19:9-10 NLT; Lev 23:22 NLT; Deut 24:19) Isn’t that what the heart of Ubuntu is? Does just using the word Ubuntu turn one away from the very heart of compassion because of semantics? Would we have reacted differently if a different word was used? Would we have reacted differently if they were white and from a different country? mart i know we are not allowed to post links , but i will mention an inspiring run by an individual in a women’s relay race at the European Championship. paul talks about running a race and she ran well,undivided, and to the end. she didn’t even know the outcome till she was told. very challenging video. i saw it on face book but it probably everywhere by now. “Am also wondering whether this is an idea that can be really understood— theoretically(in theory), or more like the way a child learns that eating ice cream is better than touching a hot stove…” It seems more often than not what draws people to Christ is His great love(ice cream) not being accused, condemned, ridiculed (hot stove). sometimes it is hard to distinguish what is best, even when sometimes it is the most difficult thing to do. we tend to pursue the path of least resistance. if a pursuit exalts God, by all means do it. just be aware the law exalts God and we distort it and think we are just peachy keen. i think of the staff/snake which God told Moses to make so the people would not die if they turned and looked to it. later the people turned it into an idol. go figure. later the staff was destroyed because it was the right thing to do. Spirit and Truth are in opposition to idol making. if not for His Grace and Mercy we would have all become like Sodom and Gomorrah. pooh i think it’s both. if no hot stove what are we being saved from? the sad thing is some christians are hot stoves. instead of being used to serve great food people are being burned. some how in His infinite wisdom he works these things out. I may have misunderstood but what I thought it was teaching was that ice cream is better than touching a hot stove. Not that we do not learn by touching a hot stove only then do we realize it burns but that love is better than hate. I was understanding it like if we placed a bowl of ice cream and a hot stove in front of a child which one would they think is better? In relation to the subject the ice cream would be sharing and the hot stove would be selfishness. was trying to broaden the ideas. the idea that both are from God and for God and His Children. it’s when we miss use His love and grace we find things cold or too hot to bear. Goldie Locks had the same problem. by faith we continue and not give up. wonder if she made amends with the Bear family? Do you believe that from the beginning that God wanted us to have hot stoves but didn’t they happen when we decided to not trust Him? I fully believe since we have chosen hot stoves that He can use the ice cream to stop the blistering. To me it seems strange to broaden the ideas when the original idea has not even been realized. Then the whole point gets totally missed. I learned when people do not understand something they normally will change the subject, demonize what was said, demoralize the person saying it or all three. God did not have rose colored glasses on when He made everything. once burned nothing will stop the damage that has already occurred. ice will take away stored heat that had built up when the injury occurred. once the heat is removed, the stove and heat remaining on the body part, the damage remains. sometimes on large burns, people reduce body temperature so much it is days before normal body temperature returns to normal. it is God, who in His mercy, chooses to heal completely, partially, or not at all, to conform us to His Son. He’s a great potter and He knows what He is doing. if i remember right the pottery goes into a stove. question, did the idea elevate man or God? For me the idea elevated God. I guess that depends on who our thoughts are on, if they are on man then that seems to be what one will see. street, let me ask you a question, is treating others as you want to be treated(Gal 5:14) from God or from man? It would seem to me that the desire to be the first and to get it all would be a natural inclination of man. Just because we do not hear the name of God used we can still see His heart. People can use God’s name all day calling themselves Christians but every behavior they display shows anything but the presence of God in their lives. Which speaks louder actions or words? poo asked,” is treating others as you want to be treated(Gal 5:14) from God or from man? i tried that in my employment and it doesn’t work. you’ll be scratching your head now. take a closer look at Galatians 5: 6.
gee, stre here I have believed that the source of love was God. I will still continue to believe that and you can think it comes from man. We will have to agree to disagree on that. I wonder which comes with more need to be heeded/heated warnings, the ice cream or the stove? I would say that naturally more people would enjoy tasting the immediate gratification that comes from encountering the ice cream, than the immediate ouch of not heading the warnings, placed their before us, for a reason. Funny how when you foolishly place them together, through a testing, like putting your preferred ice cream flavor on the hot stove, that both become watered down and useless, as useless as avoiding the warnings, or preaching that the warnings no longer apply. Don’t worry about your touching the stove, because the ice cream has already been applied. Street you are on to something here by your realizing that all the scars left from doing the wrong thing, do not just go away. There is no their, there. Many people often live up to being a hot stove. You cannot recognize the hand or heart of God unless you know Him but also you have to be looking. Some like I are content not to go deeply into their faith, I accepted Christ for my salvation but I was not looking for God. I was on the wrong path so God found me, if I had not been on the wrong path He would not have had to find me if you see where I am coming from! would you consider gravity a hot stove? you might, if there was a great distance between you and the ground. if not, you would not even think about it. it would be a given and accepted norm. now if you were in a plane would gravity be a hot stove. not really. the plane needs gravity in order to move where the pilot wants to go. the air he moves over the control surfaces of the plane are under the control of gravity till the plane manipulates them to the pilots desires. if you ignore the disciplines of flight, wind, humidity, temperature, fronts, weight, maintenance, others in the airspace, you will find a hot stove. till then enjoy the flight. sight since your conception(Psalm 139:13; Isaiah 44:24). All mankind is lost. Not lost like God has to find but lost like we have lost our way and are looking for something, little did we realize it was God that we were looking for, to fill that emptiness within our souls. A lot of people are satisfied with a superficial relationship with God just like they do with most people enough to say Hi but not enough for it to become intimate because most often they are afraid they will be rejected if someone learns who they really are. On the other hand with God He already knows everything about us and wants so bad for us to find shelter under His wings and to grow in our knowledge of Him to learn just how big His love for us is. I do not focus on God for it is were disagreements come about. I focus on Christ because in the Cross we are united but everyone I know has a very different knowledge of God. If I got into a conversation with other Christians none of us would agree on the character of God for everyone comes away from the Bible with differences but Christ unites us and surely it is better for God if we are united. So in Christ we, though many, form one body, and each member belongs to all the others. I have always believed that God wants me to focus on Christ, it is a choice I made because of all the division in beliefs about God which were people’s own interpretions from the Bible and what I seen was it was causing friction among believers and I decided I did not want to join them. I never thought I had lost God but that I was seperated from God because of my sins but Christ has put that right so that when I die I am resurrected to be with Him again. It was God prompting my spirit when I was having wrong thoughts and a wayward heart that made me realize that I did not want to sin to offend God, not because He would take away my Salvation but because I want to do that which is pleasing to God. thinking how david dealt with reuniting the kingdom after absalom’s rebellion that led to civil war. the northern kingdom who sided with absalom’s and shimie, who cursed david when he fled the city, were there in the unification and restoration of david as king. building unity and peace among so many different sinners is mind boggling. certainly grace and mercy were in great supply. Yes street, we ARE united under One spirit, aren’t we! I am so glad you enjoy reading my comments Joyce and glad also that you are a sister in Christ! I find the comments so very enlightening and encouraging which is what it is all about really. Mark 12:29,30,31 words spoken by Christ who is the Lord.